The Jive World 11 conference took place October 4-6, 2011. 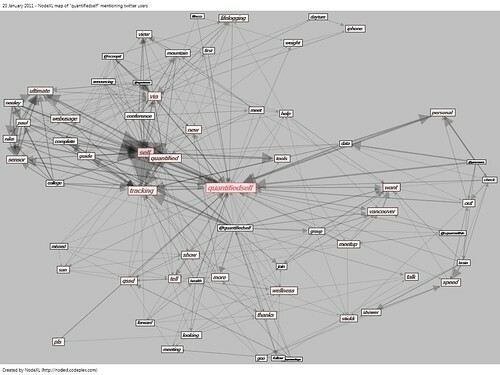 These are the connections among the Twitter users who recently tweeted the word #JW11 when queried on October 10, 2011, scaled by numbers of followers (with outliers thresholded). Connections created when users reply, mention or follow one another. The recent Strata Conference in New York City gathered many leaders in big data, data mining, and information visualization. Connections among the Twitter users who recently tweeted the word Strata when queried on September 20, 2011, scaled by numbers of followers (with outliers thresholded). Connections created when users reply, mention or follow one another. 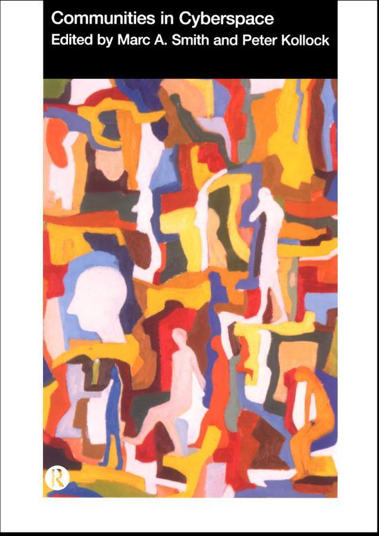 Description Look up from your phone and you will notice that offline is not obsolete. Experiences in real life (IRL) remain powerful and memorable. Online tools and social platforms are now thoroughly integrated into “offline” life on smart devices in every meeting, conference, or gathering. Marketers can now tie online and offline activity together, mapping online discussions and offline connections to spur awareness, connections, and lasting conversations. Featuring insight from the Social Media Research Foundation and case studies from some of the world’s top brands, this intermediate workshop will teach techniques for integrating social media and emerging technologies with events and experiential marketing campaigns. 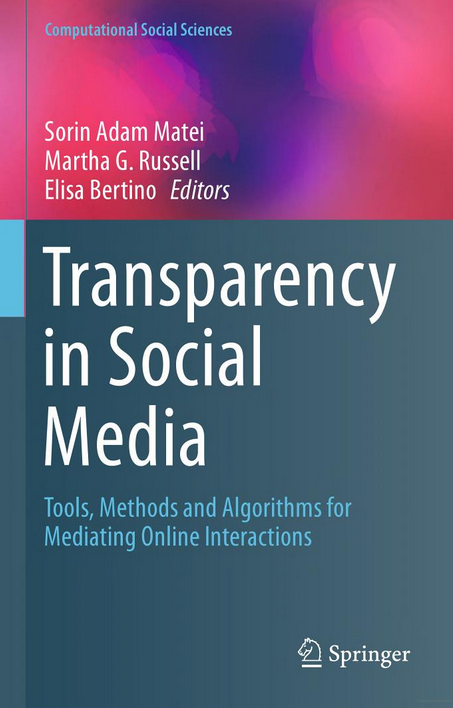 We’ll illustrate free and open tools for collecting, analyzing and visualizing patterns of how people engage with your topic using various social media channels like Facebook, Twitter and Foursquare. We will review how to augment face-to-face interactions, and present case studies of interactive events that fit cohesively into established online and offline marketing campaigns. 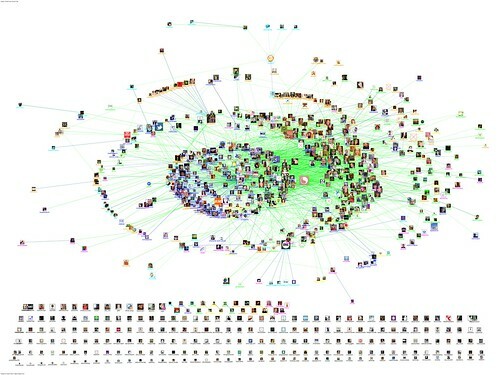 Maps of the connections that form when people communicate can reveal the key people and groups who act as your brand influencers. Learn how to make maps of your own, with no programming skills required, to guide your own engagement with stakeholders, online and off. How can marketers leverage digital media to increase the value of experiential marketing? 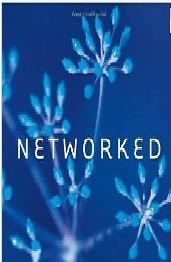 How can they create breadth and impact beyond the transaction? What are the best new platforms and tools to leverage? What was your favorite integrated campaign this year? Which brands did an excellent job of incorporating social media at events and weaving digital throughout? 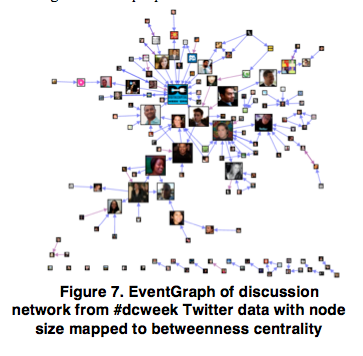 What social media data can be collected at events and conferences? 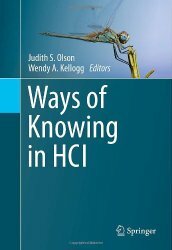 What can you do to better understand your customers through this information? 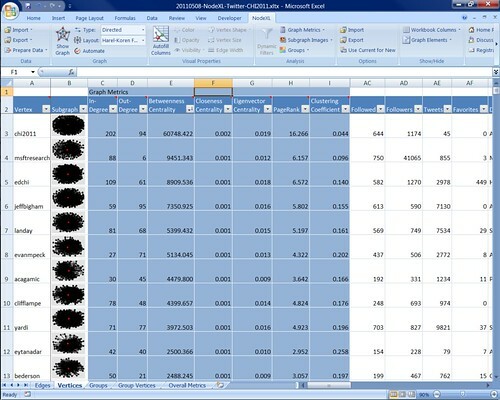 What are the best ways to compare online and offline metrics? Do we need new standards? Thanks for your vote for our SxSW panel! I plan to attend. 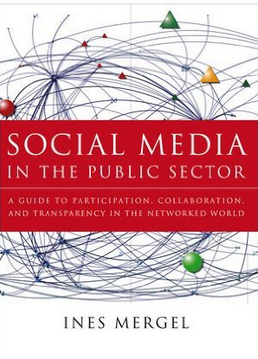 I will speak on Sunday morning at a 10:30 breakout session on using social media network analysis to map personal and collective social media spaces. 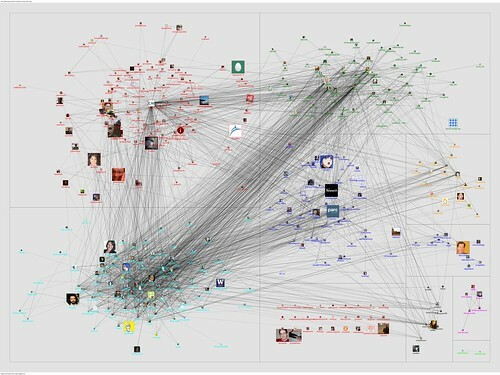 Quantifying the “Quantified Self” discussion in Twitter: Here is a map of the connections among the people who recently tweeted the string “quantified self” on May 25th, 2011. 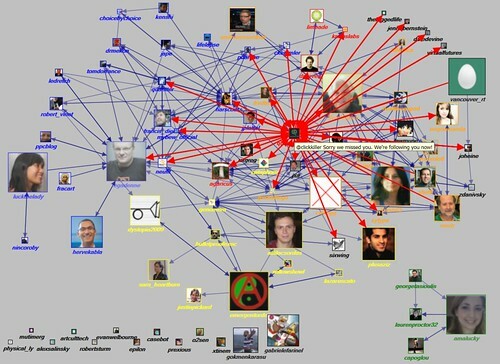 The most between participants in this graph are: @quantifiedself, @egadenne, @harscoat, @genomera, @neufit, @jxa, @agaricus, @emergentorder, @bulletproofexec, @2healthguru. The ACM CHI 2011 Conference is taking place in Vancouver, BC. 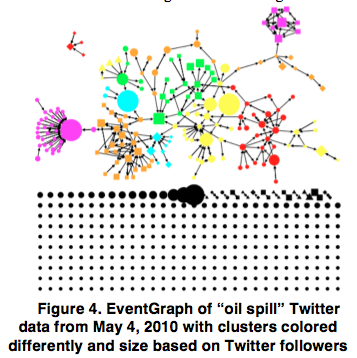 These are the connections among the Twitter users who recently tweeted the word chi2011 when queried on May 8, 2011, scaled by numbers of followers (with outliers thresholded). Connections created when users reply, mention or follow one another. 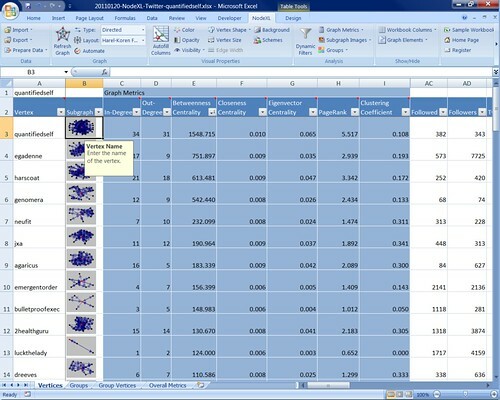 Data set in NodeXL format. 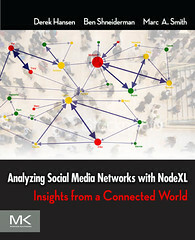 A new paper on visualizing social media has been released on the University of Maryland, Human Computer Interaction Laboratory tech report archive. 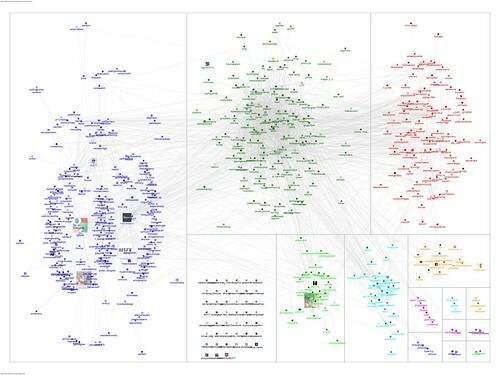 Co-authored by Derek Hansen, myself, and Ben Shneiderman, the paper describes and visualizes the patterns of connections formed when people tweet about events like conferences and news stories. Hansen, D., Smith, M., Shneiderman, B.